Using thrusters attached to his arms and back, Browning flew in a circle and hovered a short distance from the ground, captivating attendees at a prestigious TED Conference. The personal flight suit is capable of propeling wearers much higher and faster, according to its creators. "The hypothesis was that the human mind and body, if properly augmented, could achieve some pretty cool stuff," the extreme athlete and engineer said at the gathering a short time earlier. Browning told of experimenting with various numbers and arrays of essentially miniature jet engines on his limbs. Along the way, he said, there were more than a few crashes to the ground. "The whole journey was about trying and failing, and learning from that," Browning said. The first reasonably stable, six-second flight with the gear inspired his team to press on. 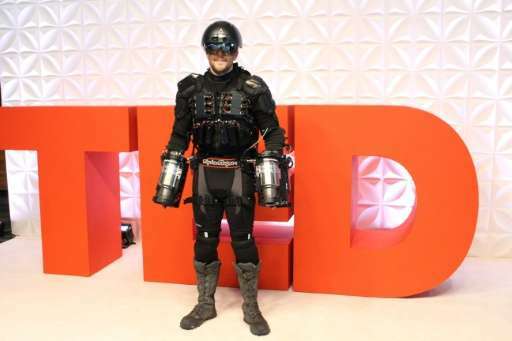 His startup, Gravity, formally debuted about a month ago with an early-version suit called Daedalus. A 55-second video clip of the suit in action has logged more than a million views since being posted on YouTube about three weeks ago. 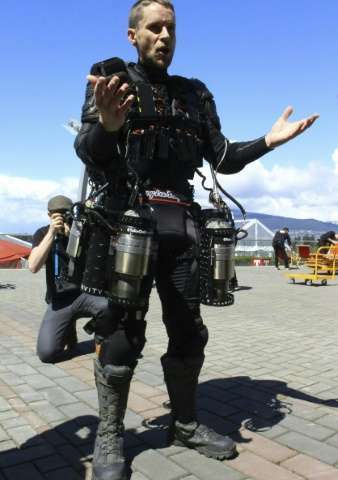 Browning said he is already getting interest from investors and some in the British military who told him they had given up on the flight feature of an 'Iron Man' suit until seeing his human-propulsion gear. "I don't think anyone is going to be going down to Wal-Mart with it or taking anybody to school for quite a while, but the team at Gravity is moving it along," Browning said. He dreams of a flight suit that one day will allow its wearer to launch from a beach, soar along the coast and then perhaps hop into a helicopter in the air to continue their journey. Browning has already seen the early-version flight suit compared to 'Iron Man' armor worn by Marvel Comics character Tony Stark, but stressed that his goal is firmly rooted in the real world. He also described the project as part of a personal journey, inspired by an engineer father with a love for flying machines, but who died when he was just a teenager. I suppose if you added a bunch of attitude, location, and acceleration sensors to a computer control setup it might work. The arm turbofans are a gimmick, designed to exploit the resemblance to the extremely popular Iron Man movie franchise, but a founder's got to do what a founder's got to do. The fuel tank, pump, and regulation system in the backpack is .. faintly terrifying. Good engineering, though, using a vectored quadrapod around the pilot COG (as much as possible). Note the 2 lumbar unit vectors, and the use of the arm units as two of the legs. Clearly, at no time do you want to have any propulsive force transmitted through the human frame. That's just nonsense, but as I said, FGTDWAFGTD to get the money to come in. Much more computer. It's going to end up being a capusule, free-freestanding when at rest, because if you can't go fast enough to tear your clothes right off why bother? @retro, yeah, I had quickly envisioned the same 8 jet (quad pairs) around a bubble setup, and with the kerosene jet these are almost low tech, comparatively. It will last somewhat longer than the propane jets that had 5 min airtime max, especially with a pod setup. And yes quitana, it appears he is making use of ground effect. However, that may be for safety reasons, I imagine that he could power up from that point, but it is taking him to be nearly a Superman anyways with the 'core strength' to be able to control his critter anyhow. I think the arm jets are for stability. Without them he would faceplant. "Gimmick" would appear to be an appropriate understanding of this project, almost certainly just another pump'n'dump startup with very obvious and fatal flaws, as presented. Yah even stark used them to obvious effect. A Segway would be so much easier. Not in the air it won't....LOL.